Home › Blog › When Should I Book My Wedding Vendors? As soon as you and your fiancé decide on a wedding date, it's time to start finding your vendors and booking them. Many venues, photographers, videographers, DJs, and other service providers have their calendars set months – sometimes even a year or more – in advance so you don't want to wait and risk losing the vendor you want. Based on our couples' experiences and a variety of wedding planning resources, here's an approximate timeline of when you should start conversations with your various potential vendors. Your wedding date is not official until you secure the ceremony and reception location. This should be the very first contract you sign, because every other vendor you hire will need to know when and where to be on your wedding day. Start looking at venues as soon as you and your fiancé have an idea of when you want to get married – you don't want to fall in love with a reception hall only to find out that your date isn't available. Some couples choose to hold their ceremony and reception in the same place, but if you want your ceremony in your house of worship or another off-site location, you should book that before the reception venue. You should also confirm that your chosen reception venue offers an on-site catering package. While many do, some do not, so this may be an additional vendor for you to research and book. If you're hiring an outside caterer, this should be done within a few months of booking your venue. 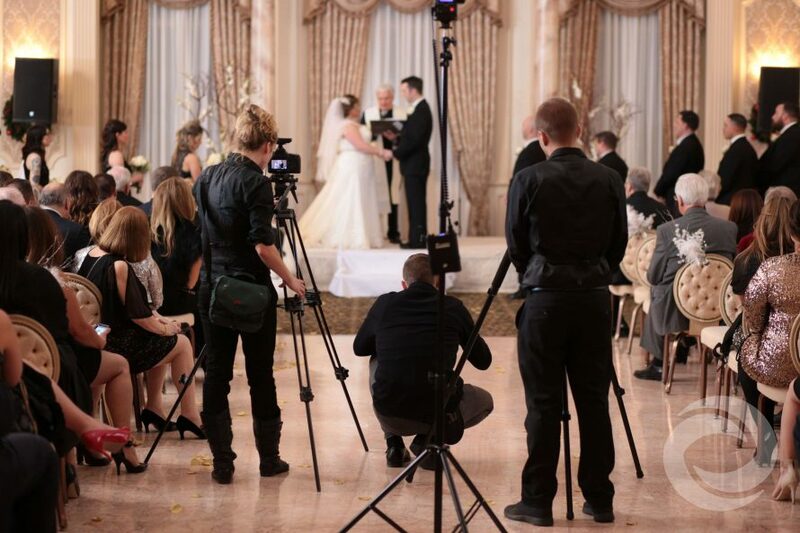 Like your photographer, a high-quality wedding videographer in your area will book up quickly. Some photographers also offer videography services, so you may be able to secure both at once. Be sure to ask about their videography style and look at samples to make sure their creative vision aligns with yours. Whether you're hiring a DJ or a live band, your wedding entertainment provider sets the mood and atmosphere for your wedding reception. You'll want to get to know the person or people who will be interacting with your guests throughout the event; it's important that you find someone you feel comfortable with. A great wedding entertainer will listen to you and work with you to plan your playlist and timeline based on your preferences. This is also a good time to think about ceremony music. Will your reception DJ provide a ceremony sound system, or would you prefer to hire a separate musician to play while you walk down the aisle? Either way, it's a good idea to get your entertainment lined up early. Choosing a wedding officiant is often a very personal decision for an engaged couple. You want someone who is not only comfortable speaking in front of a crowd, but also knows you individually and as a couple so they can personalize the ceremony. Churches and synagogues typically provide an officiant for you, but if you're getting married elsewhere, you will need to select and book the person who will perform the ceremony. Some couples want to get married on a particular date because it holds significance for them, like a special anniversary or holiday. If you and your fiancé are set on having your wedding on a certain day, you should book your major vendors as early as possible to ensure that your preferred providers are available. You may have to compromise on certain vendors if your wedding date is a popular one. If you're more flexible about your specific wedding date and have a backup weekend in the same month or season, you may have a better chance of getting the venue, photographer, or entertainer you want. Regardless, it's wise not to announce your official date to friends and family until you've secured your major wedding vendors, just in case something falls through during the booking process. Ready to book your wedding DJ, photographer, or videographer? Get in touch with Hurricane Productions to check our availability for your date, or visit our pricing page to learn about our all-inclusive packages.